This is a great breakfast idea when a group of people is involved. 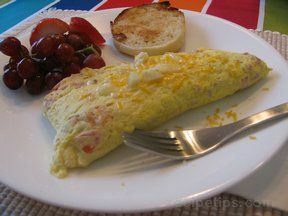 All the omelet fixings can be ready to go and people can come and make their own individual omelet as they wake up. 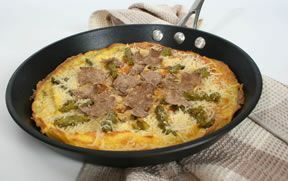 Delicious and actually prettier to serve than some of my omelets I attempt at home in a regular skillet. Crack two eggs into zip lock freezer bag and mix them. 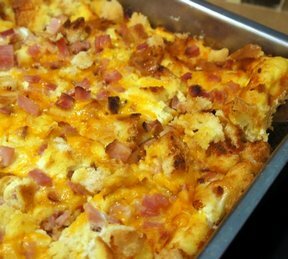 Add any ingredients that you would like: Cheese, meat, vegetables, hash browns, etc. Remove all air from bag and seal bag. Use permanent marker and write names on bags. Drop bags in boiling water and boil for 12-15 minutes. Can make 3-5 omelets at once depending on pan size. 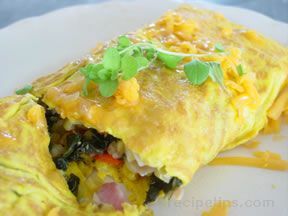 Omelet comes out of bag with no mess.